Whilst Chamonix is the capital of world mountaineering, you do not need to be an experienced mountaineer to enjoy its vast mountain attractions. On the contrary, one of Chamonix’s real assets is that it has peaks and climbs suitable for all levels of challenge and for every step along the path to Becoming an Alpinist. 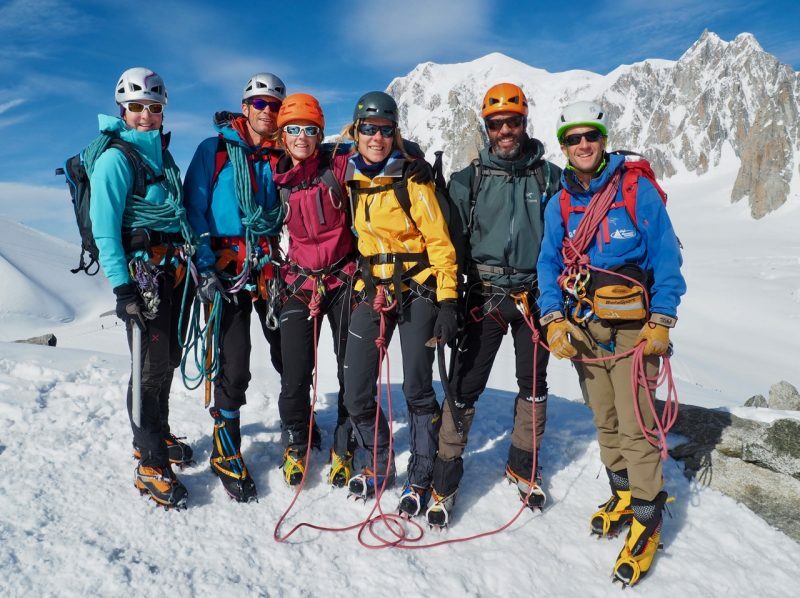 This alpine training course is designed for those who want to learn and develop their mountaineering skills with crampons, ice axe & mountaineering boots whilst doing some inspiring glacier journeys & climbing alpine ridges and peaks. During 5 action packed mountain days, this course aims to provide you with high quality training in all the alpine essentials whilst completing some fine peaks and fun routes along the way. This blend of mountaineering, training and climbing will give you a sound understanding of the essential practical skills of alpinism and a suitable context in which to use & develop those skills. The course will also be a fun & sociable week completing some great mountain journeys with a like minded team. 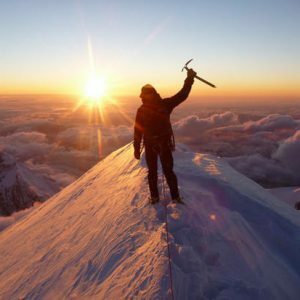 The week features 3 Chamonix day trips focussing on mountaineering skills, glacier journeys, rock scrambling / climbing, movement skills and ropework training before heading East in to the Swiss Valais Alps for the final 2 day overnight mountain hut expedition to climb the Pigne d’Arolla*. Please note that for this early season programme – the Dix Hut on the Pigne d’Arolla is still closed – so there will be an alternative hut / ascent planned according to prevailing weather / conditions and team fitness and ability. In the past we have often climbed the Gran Paradiso at the end of this course. 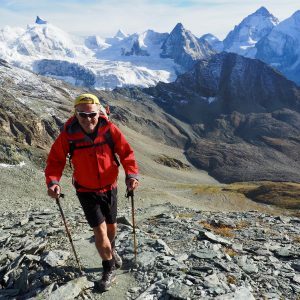 Intro Alpine Team Training From Skyway Monte Bianco – With Monte Bianco Behind! Thus a superb varied 5 day programme and good value with the 1:4 open course ratio. An action packed week and great opportunity to build skills whilst doing lots of good mountaineering in a team of other like minded guests. 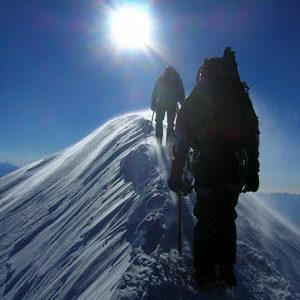 A good fitness level is required for alpine mountaineering days 6 – 8 hours in duration. The traverse of the Pigne d’Arolla on the last day is particularly physical and you should be well prepared for around 8 hours on the go at high altitude. It not necessary to have any background of rock climbing or winter mountaineering although any climbing experience, even at a climbing wall will be useful, as will any general hill walking and scrambling experience. This course would also be suitable for climbers with some technical experience who are keen to receive alpine specific training and develop their personal skills with a view to climbing independently after the course. It was a great week! Huge thanks for Jonny for his amazing guiding during the week. I not only learnt a ton of new information through his expert instruction, but received a ton of great suggestions for other places to explore and build on going forward from the course. Plus, he was a brilliant leader making each day fun and enjoyable as well, and catered wonderfully to each member of our group’s skill sets and what we wanted to get out of the course. I’m stoked to build on what I learned during the week. Thanks Jonny! James and I just wanted to say how much we enjoyed the course. Johnny was a fantastic guide and we learnt a huge amount over the 5 days. 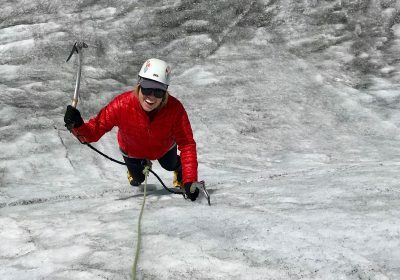 We’d definitely recommend the Chamonix intro alpine course and Johnny to other people.